In 1993, the body of 5-year-old Kimberly Trickey was found on Lookout Mountain after months of searching. Her mother, father and two little brothers had offered no plausible explanation for her disappearance. After her already decomposing little body was found, her father admitted to disposing of his daughter’s body after his wife had beaten her for the last fatal time. Kimberly’s death provided the spark that ignited the CAJA program in Marshall County by provoking a concerned citizen into action. Her name was Shauna Murdock, and her children played with Kimberly and her brothers next door when Shauna visited her mother’s home in Albertville. Upon learning the fate of her children’s playmate, Shauna simply could not believe or accept that anything so terrible could happen in the area where she lived and was raising her family. She heard about CAJA volunteer training in Madison County and decided she was going to do something to prevent the death of another child like Kimberly. After completing the training, Shauna contacted Marshall County’s Presiding Juvenile Court Judge at the time, Judge David Evans, and then-Marshall County DHR director Wayne Sellers, who were both instrumental in getting the CAJA program started in Marshall County. 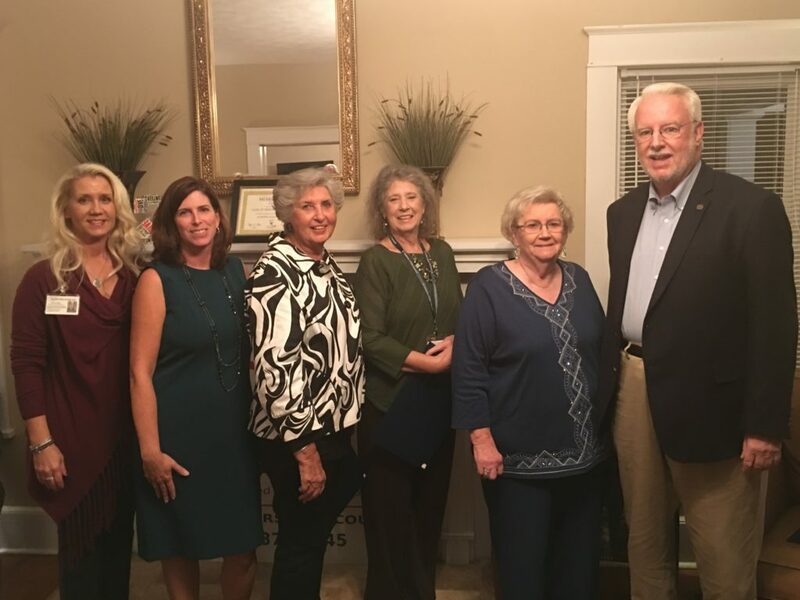 A board of directors was formed that included Wayne Sellers, Melody Evans, Mary Denham, Ramona Rosser, Bill Lynch and Shauna Murdock. Steve Marshall donated his time and services pro bono to help CAJA incorporate as a non-profit, and CAJA was able to obtain United Way funding. In 1996, Katie Wilkes was hired as the first director of CAJA, and Judge David Evans and Judge Tim Riley swore in eight new volunteer advocates as officers of the court in 1997. CAJA volunteers include everyday citizens – teachers, businesspeople, retirees and grandparents – who are willing to participate in an in-depth training program and commit to advocate for their assigned child while the case is in the family court system. To celebrate this milestone, CAJA of Marshall County hosted an open house on Thursday, Nov. 9, at the CAJA office in Albertville. CAJA staff and board members welcomed the guests, which included judges, attorneys, board members, volunteers, and members of the community. We are blessed to be a member of this community and to receive such amazing support. Judge Tim Riley, Judge David Evans, Melody Evans and Judge Jay Mastin spoke. Rep. Kerry Rich was also on hand to present a special Senate resolution, introduced by Sen. Clay Scofield, commending CAJA on its 20 years of service to Marshall County and honoring three long-time volunteers. Peggy Shell of Albertville, Susan Beck of Union Grove and Judy McMurry of Guntersville were presented copies of the Senate resolution and honored for their two decades of service to CAJA and the children of Marshall County. Peggy Shell and Susan Beck were sworn in as volunteer advocates in April 1998, and Judy McMurry was sworn in as a volunteer advocate in November 1999. Combined, these three dedicated volunteers have helped hundreds of abused and neglected children in our county obtain placement in safe, permanent, nurturing homes. They embody the true spirit of selfless giving of their time and talents. CAJA holds several training classes each year for those wishing to become volunteer advocates. Information and a volunteer application can be found on the website, www.cajaofmarshall.org, or by contacting the CAJA office in Albertville at 256-878-1445.